Let’s start with the warm up exercise of the current 2016 autumn by Dongchan Lee (simply because the original version was too good to be true by any standard in the education establishments and Lee is using only about 4-8% of the original capacity for the MMU1 operations to achieve the acceptance first). 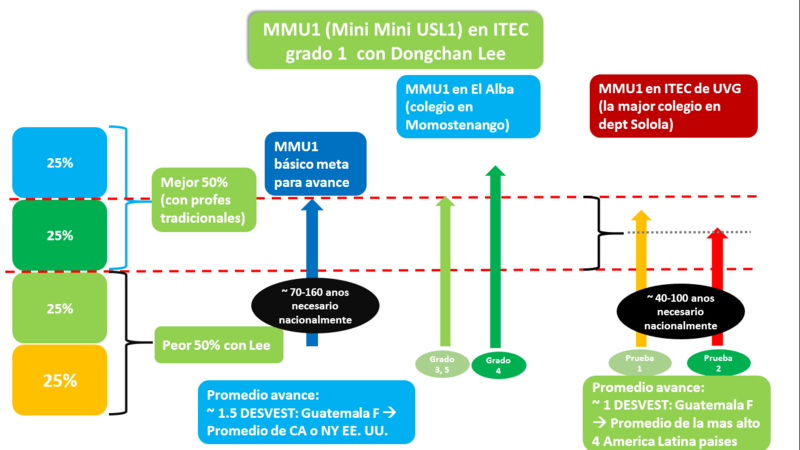 MMU1 (Mini Mini USL1): Scaled down version of the original USL (in Autumn 2016-early 2017) to end the math poverty. MMU1 to empower the worst half of the math students to rapidly rise to be equal or better than the traditional best half of the math students. MMU1 operation result summary in September-October 2016: Lee basically demonstrated that he boosted the average math of the worst half to the average of the best half more or less in each 4-6 class sessions during each pilot study series. In this short 5.15 minute video, Dongchan Lee summarizes the main motivations, evidences and targets of MMU1 in autumn of 2016 to 2017. Video testimonial: Lee made the school math average of the worst half math students of the entire grades 3, 4, and 5 (taken by Dongchan Lee) rose higher than the school math averages of the half math students (taught by the traditional teachers of math in the school) after 5 days of Lee’s pilot studies in collaboration with the private school called El Alba of Momostenango, Guatemala. Video testimonial: Lee hizo la media de matemáticas de la escuela de los peores estudiantes de la mitad de matemáticas de la totalidad de los grados 3, 4 y 5 (tomada por Dongchan Lee) se elevó más alto que los promedios de matemáticas de la escuela de los estudiantes de la mitad de matemáticas (impartidas por los maestros tradicionales de matemáticas en la escuela) después de 5 días de estudios piloto de Lee en colaboración con la escuela privada llamada el Alba de Momostenango, Guatemala. Video testimonial of the director Pedro Esquinas from ITEC of UVG (Universidad del Valle de Guatemala) in Altiplano campus of Solola of Guatemala, which is normally considered to be the best school from the Solola state of Guatemala. Video testimonial of the director Juan Carlos Villatoro Rosales from ITEC of UVG (Universidad del Valle de Guatemala) in Altiplano campus of Solola of Guatemala (October 24, 2016), which is normally considered to be the best school from the Solola state of Guatemala. These results were exceedingly difficult for the normal education establishments to accept as a real possibility because the results were simply impossible. Over a thousand student participations from Oxaca, Mexico and Solola state of Guatemala.